from 'Engtanz Depression' [CD|LP|DIGITAL] Denovali Records · den221 available on all formats at [http://denovali.com/sanktotten] The German instrumental duo SANKT OTTEN, founded in 1999, consists of Stephan Otten (drums, programming, synthesizer) and Oliver Klemm (guitar, synthesizer, piano), and has been releasing on Denovali Records since 2009. Their eighth album ENGTANZ DEPRESSION (engl. : CLOSE DANCE DEPRESSION) expresses a significant progression of their material on the preceding album trilogy (Gottes Synthesizer, Sequencer Liebe, Messias Maschine). New drum sounds and acoustic instruments such as harmonium and piano may be found, and some pieces emerged from free improvisations, which is a completely new approach taken by this band. The album starts with "Urlaub Unter Psalmen" which builds up slowly, piles up further, just to completely disintegrate in the end. Klemm’s typical E-bow guitar parts and the dubby baseline make this track a catchy tune. Next is "Beten, Tanzen, Küssen" which is the first Sankt Otten track ever where a harmonium appears. In combination with the minimal beat one could even think that this track is suitable for a club context, but the two musicians always manage to stay away just enough from the ordinary and remain slightly disturbing as ever. "Im Lichtorgelparadies" switches on the lights in paradise with a hypnotic synthesizer melody and the KRAFTWERK-like beat gives the track a floating ease. One of the album highlights is the 12-minute monster "Sing die Apokalypse", which is dominated by Otten’s powerful, but always minimalistic drumming. After about 10 minutes the listener might think that the apocalypse has aleady arrived, but Sankt Otten move on and manage to even increase this feeling. The track ends unexpectedly and with a winking bow to the influential American electronic protopunks SUICIDE. 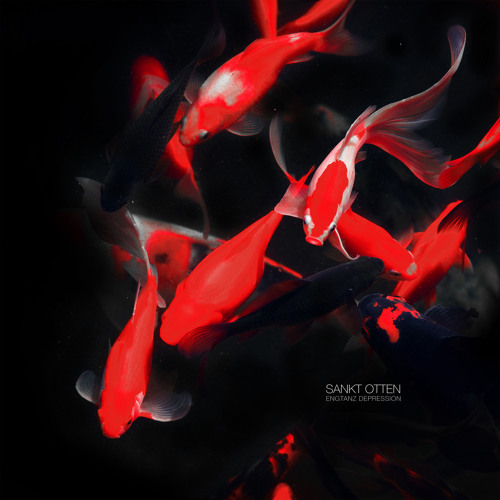 However, Sankt Otten also demonstrate that they can still master the meditative sounds. Tracks like "Der Himmel ist voll" or "Die tragische Nummer" are quite far apart from average electronica. The titles of the tracks appearing on the album are as always a unique mixture of aphorisms, sarcasm and puns. In spite of the new directions explored on this album, SANKT OTTEN maintain their characteristic Holy Trinity of krautrock, ambient, and 80ies electronica. Floating, meditative, dazing and catchy at times.